An easy recipe for a sweet, guilt-free treat! 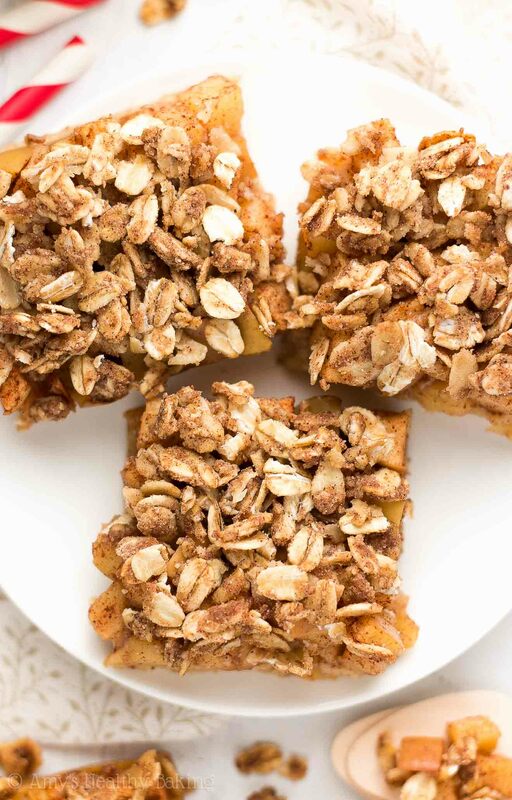 Sugar cookie crust topped with spiced apple filling and a cozy streusel topping. No eggs, refined flour or sugar & only 67 calories! As a college undergraduate, I worked in an organic chemistry lab alongside graduate students to gain research experience. Our advisor gave me my own project, just like he did with the grad students, so in between my regular classes and homework, I ran experiments to try to synthesize a small molecule with anticancer potential. Around both lunchtime and mid-afternoon, many of us flocked to the small break room located next to one of our lab facilities to eat and re-caffeinate. Most of the grad students went through multiple big mugs of coffee or tea every day to keep up with their workload—and our advisor did, too! 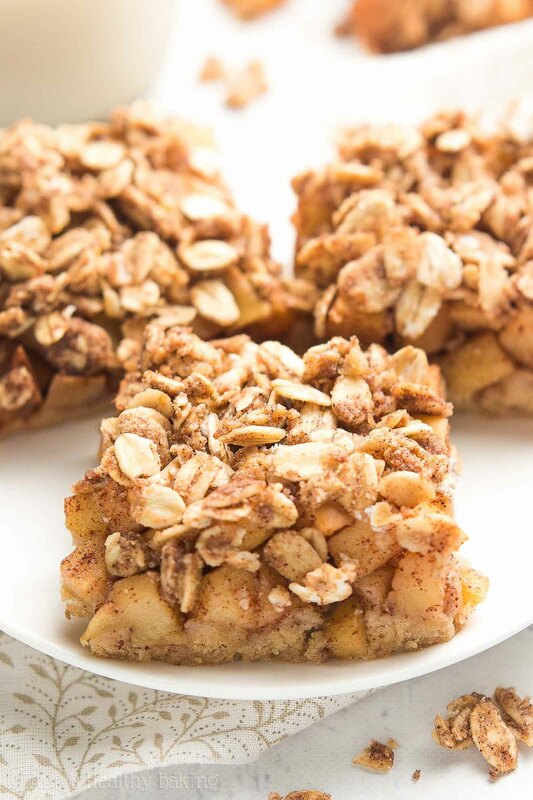 These Healthy Small Batch Apple Crumble Bars probably would have been a much better solution! They have those same sweet fruity and cozy spiced flavors that my friend was craving, but they’re quicker to make than an entire apple pie from scratch… And there are virtually no tempting leftovers to deal with! Besides, who can resist a sugar cookie crust and a hearty oat streusel on top? Certainly not me… Especially with fall vibes in the air! ? So let’s go over how to make these healthy treats! We’ll start from the bottom… aka the cookie crust! That’s right—you’ll begin with my favorite egg-free cookie dough! You’ll use white whole wheat flour (like this!) for added nutrients, like extra fiber (it has the same health benefits as regular whole wheat flour! ); coconut sugar (like this!) for sweetness; and milk to replace the eggs. So yes, this cookie dough is safe to eat raw… But if you’re going to do that, I highly recommend making extra so you still have enough to cover the bottom of your pan! Note: If you don’t have an 8×4” loaf pan (they’re very useful! ), then use two mini loaf pans instead. Next up is the filling! 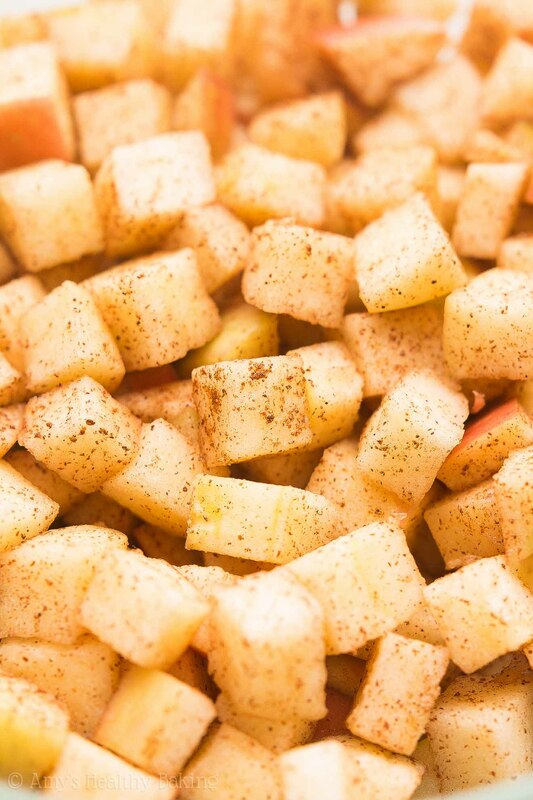 It’s just a mixture of finely diced apples, cinnamon, and a hint of cornstarch. I used red Fuji apples because they’re already very sweet and firm, so I didn’t need to add any additional sweetener to the filling. Hooray! And finally, the streusel topping! 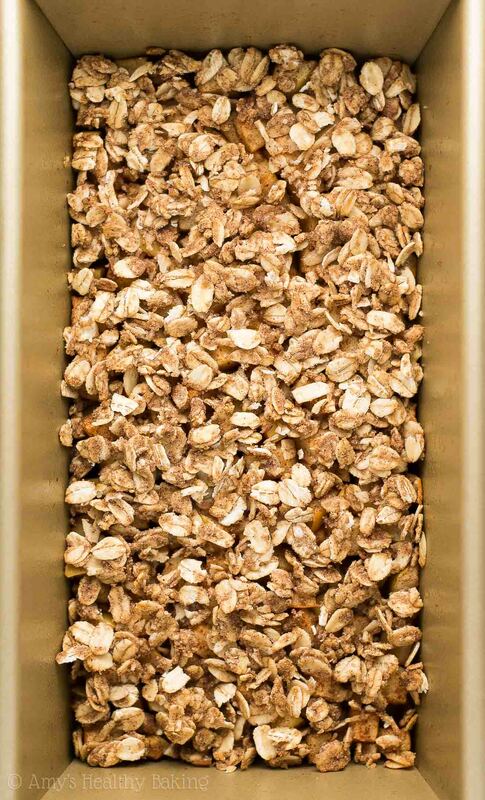 You’ll stir together oats, cinnamon, and a touch more white whole wheat flour. Then stir in a tiny bit of melted butter and pure maple syrup (like this!) for sweetness. The topping tends to clump, so remember to break it up with your fingers into much smaller pieces while sprinkling it over the filling! How does that look?? I wouldn’t blame you if you said you didn’t want to share! ? And when you make your own, remember to snap a picture and share it on Instagram using #amyshealthybaking and tagging @amyshealthybaking IN the photo itself! (That guarantees I’ll see your picture! ?) 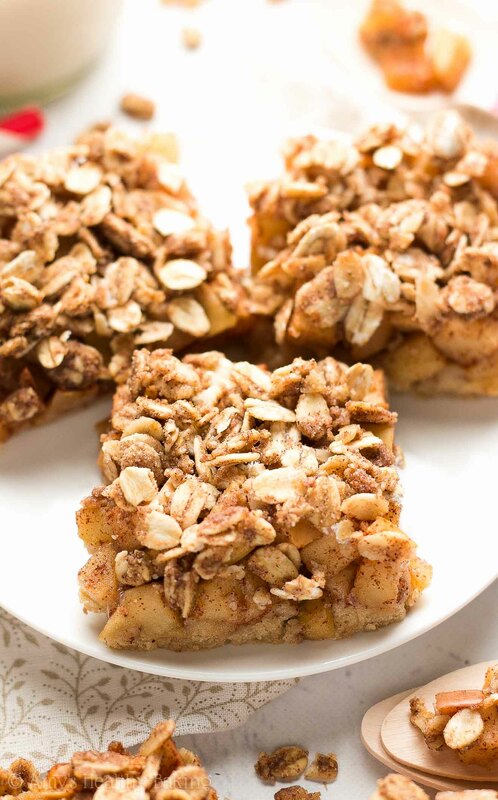 I’d love to see your apple crumble bars and feature them in my Sunday Spotlight series! 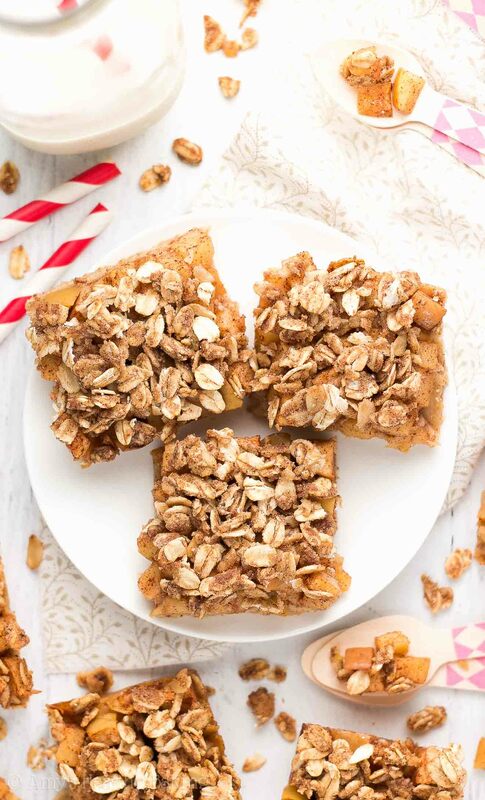 These bars are perfect for when you’re craving apple pie and don’t want to make one from scratch… Or have lots of tempting leftovers lying around! The bars are best if eaten within 2-3 days, but they’ll keep for at least one week if stored in an airtight container in the refrigerator. Preheat the oven to 350°F, and coat an 8x4” loaf pan with nonstick cooking spray. 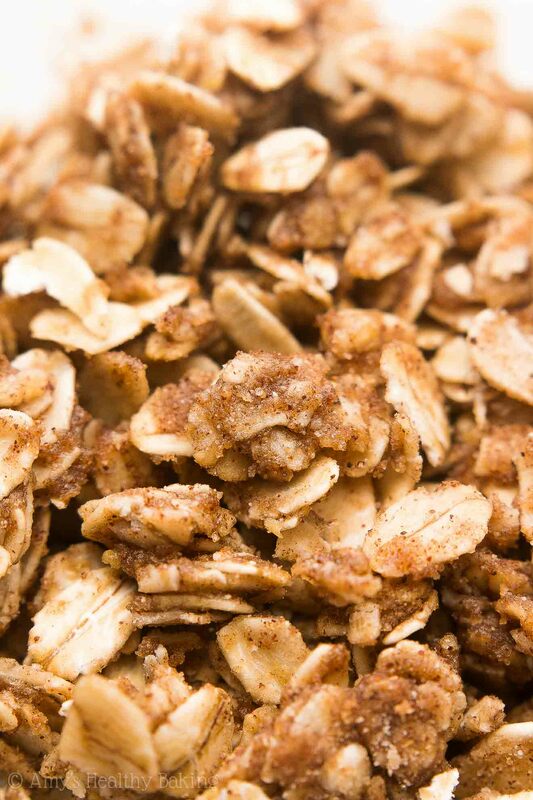 To prepare the topping, stir together the oats, flour, and cinnamon. Make a well in the center. Pour in the maple syrup and butter, and stir until all ingredients are completely incorporated. To prepare the filling, gently toss together the apples, cinnamon, and cornstarch until the apples are evenly coated. To prepare the crust, whisk together the flour, baking power, and salt in a small bowl. In a separate bowl, whisk together the butter, milk, and vanilla. Stir in the coconut sugar. Add in the flour mixture, stirring just until incorporated. Press the crust into the bottom of the prepared pan. (If it sticks to your spatula or fingers, then moisten your fingers with a tiny bit of water, and continue as needed.) Spread the filling evenly across the crust. Sprinkle the oat mixture on top of the berries. (It tends to clump, so break it into tiny pieces as you go!) Bake at 350°F for 30-35 minutes or until the topping feels firm and the crust appears to be done. Cool completely to room temperature in the pan, and let the bars rest for at least 3 hours once at room temperature before slicing and serving. Notes: Whole wheat pastry flour, regular whole wheat flour, or all-purpose flour may be substituted for the white whole wheat flour. Any gluten-free flour, except coconut flour, may be substituted for the millet flour. In the crust, use the following gluten-free flour blend: 2 ½ tablespoons (19g) millet flour, 1 tablespoon (7g) coconut flour, and ⅛ teaspoon xanthan gum. Most store-bought gluten-free flour blends will work, if measured like this. Agave or honey may be substituted for the maple syrup. I love using red Fuji apples because they’re already plenty sweet (so no need to add any sweetener to the filling!) and firm enough for baking. If you prefer a thicker layer of streusel, then double the topping. This is the 8x4” loaf pan that I use. If you can’t find one (and they’re really handy to have! ), then divide the batter between two mini loaf pans (they should be 5¾x3” in size). Do not use a 9x5” loaf pan. Oh my gosh, that’s too funny about your friend and the Costco apple pie!! I actually didn’t have any of the one my friend brought to campus… But with what good things I’ve now heard about it, I kind of wish I had a slice! 😉 SO proud of you going back for your teaching credential — you are AMAZING!!! I’m confused. I had to double the recipe to fit into the 8×4 loaf pan. I really appreciate your interest in my recipe Claire! Did you double everything — the crust, the filling, and the topping? I also had to double the crust to cover the bottom of the loaf pan. I doubled the whole recipe to fit into one pan. Because I doubled everything, it was more like a cake than a bar. But, it was delicious! I’m going to continue to double the recipe. Everyone in my family loved it. I love that it’s minimally sweet and big on apple flavour. I love your blog. I’ve used many recipes from your blog. Thank you and keep up the great work. I’m so glad everyone enjoyed this dessert Jenn! It means a lot to me that you’d want to make it again in the future. 🙂 I can’t wait to hear what recipe you decide to try next! Hi, these looks so yummy I cannot wait to try baking it myself, but was wondering how long would these last in the fridge our out? I really appreciate your interest in my recipe Byrna! I’ve actually covered this already in the text directly beneath the recipe title in the recipe box. I know it can be easy to miss! 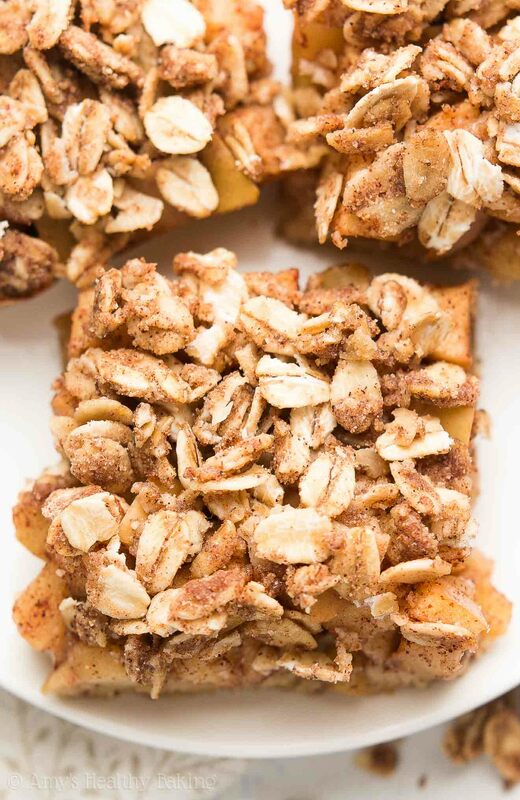 🙂 I’d love to hear what you think if you try these crumble bars!